Interested in joining the PFI Standards Program? Visit our page with detailed information on what it takes to join the program. You can also learn more by watching our informational webinar recorded in February 2016. The PFI Standards Program is a third party accredited program that enables consumers to easily identify PFI Graded Fuel - consistent, reliable pellets from producers whose facilities are subject to regular third-party inspection and lab testing. The program's qualified production facilities can be identified by the Quality Mark found on their bags of pellets. Pellet Stove Owners: Consistent, reliable quality pellets, like those from producers that have been qualified by the PFI Standards Program, will help a stove perform the way it was designed by burning cleaner and more efficiently. Many pellet stove manufacturers recommend only using PFI Graded Fuel from qualified producers. It is becoming more common for pellet stove owners’ manuals to require the use of only PFI Graded Fuel for a warranty to be recognized as valid. 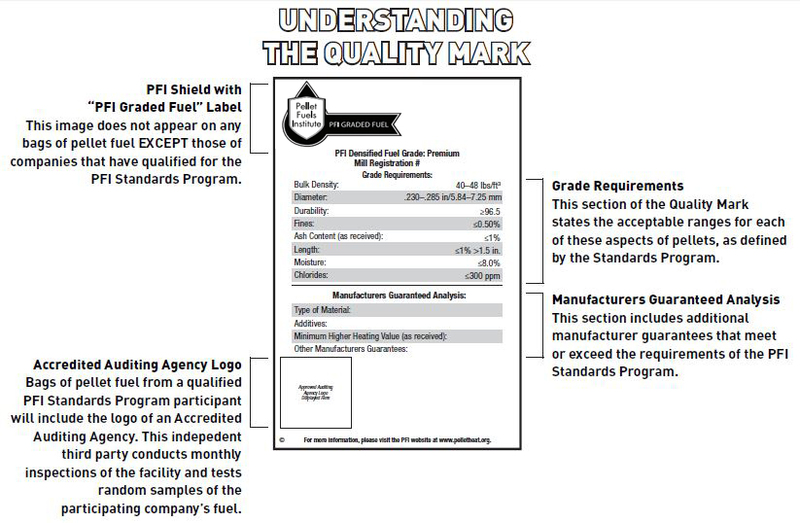 To identify pellets from manufacturers that have qualified for the PFI Standards Program, simply look for the Quality Mark (shown below) on the bags of fuel you purchase. The Quality Mark is the ONLY symbol that identifies pellets from qualified producers. Ask your local retailers how to purchase fuel from these qualified manufacturers of PFI Graded Fuel! Pellet Producers: The PFI Standards Program is the most respected of the pellet fuel standards programs, and the Quality Mark (shown below) is steadily becoming a recognized symbol that consumers look for to identify PFI Graded Fuel. The first step in joining the program is to contact one of the accredited auditing agencies listed on PFI’s website to signal your intention to join the program. This agency will guide your company through the qualification process – and continue to ensure that your facility meets the program’s ongoing requirements. Read more detailed information about the Standards Program and its background. Pellet and Stove Retailers: Customers are increasingly asking for PFI Graded Fuel with the Quality Mark. The quality of these pellets is consistent and reliable due to the regular third-party testing. Your staff can easily help customers identify pellets from qualified manufacturers: PFI Graded Fuel is the only type of fuel with the Quality Mark (pictured below) printed on the bag. View a list of Qualified pellet producers now. Stove Manufacturers: For all new pellet stoves, manufacturers must now include language in their appliances’ owner’s manuals encouraging or requiring the use of PFI Graded Fuel to maintain good standing for warranty purposes. Consistent, reliable quality pellets, like those from producers that have been qualified by the PFI Standards Program, will help extend the life of a stove by burning cleaner and more efficiently. PFI regularly communicates information about the Standards Program to its newsletter recipients. Sign up for more information. Requires any new non-commercial wood-burning appliance to utilize fuel that has been graded through an EPA-authorized standards program including the PFI Standards Program. For appliances such as pellet stoves, manufacturers will be required to state that their products have been tested with fuel from a particular grading program. Manufacturers also must state such claims in the owner’s manuals and in their product warranties, or they will be voided.